This image from a simulation shows an energy jet launched from a spinning black hole surrounded by a disk of accreting material. The black hole is spinning at half the maximum rate, and its mass is that of the black hole at the center of the M87 elliptical galaxy. The central black hole 'shadow' due to extreme light bending is apparent in this simulation. A peek at swirling matter around a giant black hole verifies that it is the source of a monstrous blast of energy thousands of light-years long, researchers say. Bursts of energy known as relativistic jets spew out matter at close to the speed of light. These jets can travel across an entire galaxy, suggesting they can affect the evolution of the galaxy. "For a long time, astronomers have theorized that black holes and the matter swirling around them were responsible for the jets we see in some galaxies, but we've never had a telescope with the resolving power to verify this,"said study lead author Sheperd Doeleman, an astronomer at MIT's Haystack Observatory in Westford, Mass. 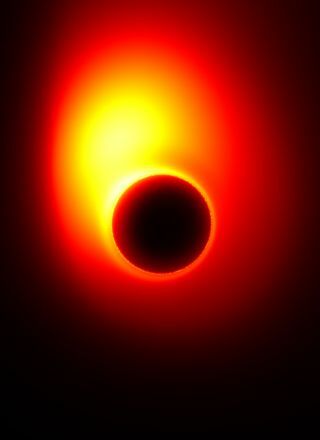 This views show the simulated event horizon-resolving images for the ultra-relativistic jet launched from the 7 billion solar-mass black hole at the center of the giant elliptical galaxy M87. The researchers used their new array, known as the Event Horizon Telescope, to look at "the base of the famous jet in the galaxy called M87," about 54 million light-years from Earth, Doeleman said. The center of virtually every galaxy is home to a supermassive black hole millions to billions of times the mass of the sun. Scientists have long suspected that relativistic jets came from the accretion disks of gas and dust pulled toward these black holes by the black holes' immense gravity, whirling like water flowing around a bathtub drain. The new array combined data from three observatories in Hawaii, California and Arizona to look at the relativistic jet in M87, which has a central black hole about 7 billion times as massive as the sun and about as wide as the solar system. The size of the region the relativistic jet originated from matches the estimated size of the innermost stable circular orbit of M87's accretion disk. This area is about five times the size of the solar system, or 750 times the distance from Earth to the sun. "It is remarkable to me to think that we have the ability to measure the size of the region where matter orbits a black hole just before it disappears from our universe forever," Doeleman said. The Event Horizon Telescope (EHT) is a growing array of radio dishes that combine to form a virtual Earth-sized telescope with magnifying power more than 2000 times that of the Hubble Space Telescope. Using this technique, known as Very Long Baseline Interferometry (VLBI), an international group of astronomers has now measured the launch point of a relativistic jet of that is powered by a supermassive black hole at the heart of a galaxy called M87. Scientists were unsure whether relativistic jets need a spinning black hole to form, and if so, whether they were more likely to arise when accretion disks spin in the same direction as their black holes. The researchers found "the size of the jet launch point was so small that the best explanation is that the black hole has to be spinning and the orbiting matter has to be moving in the same direction as the black hole is spinning — think of the planets orbiting in the same direction as the sun is spinning," Doeleman said. "Our result is just the tip of the iceberg," Doeleman added. "We've used just three stations in a global Earth-sized virtual telescope to peer deep inside a relativistic jet. We are about to add critical new stations to this Event Horizon Telescope, which will bring us closer to imaging a black hole boundary than we have ever been before." The scientists detailed their findings online today (Sept. 27) in the journal Science.